For more superficial areas of concern, Dr. Vendetti recommends BELOTERO BALANCE®. This filler is FDA-approved to temporarily smooth out and fill in moderate-to-severe wrinkles and folds, such as nasolabial folds (the folds that go from the side of the nose to the corner of the mouth) and vertical lip lines. 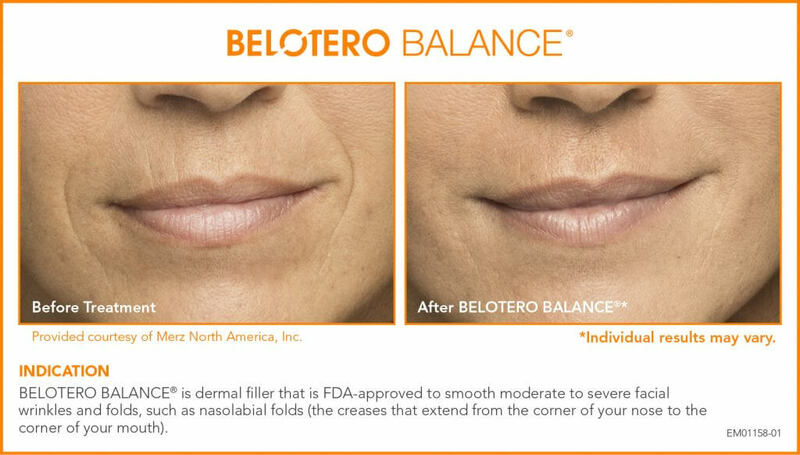 BELOTERO BALANCE® stands apart from other dermal fillers because integrates within your skin’s tissue to help smooth moderate-to- severe etched in lines and wrinkles. This hyaluronic acid (HA) filler integrates directly into the skin, enhancing your appearance with minimal downtime. After just one treatment of BELOTERO BALANCE®, moderate-to-severe etched-in lines and wrinkles are noticeably smoother with a natural look and feel. How is BELOTERO BALANCE® Different? Only BELOTERO BALANCE® is created using the Cohesive Polydensified Matrix (CPM) process. This proprietary technology allows BELOTERO BALANCE® injectable gel to evenly and completely blend into your skin, providing a natural look. 1-3 Instead of sitting under the skin’s surface, it seamlessly fills an area in a way that’s similar to honey filling in the holes of a honeycomb. 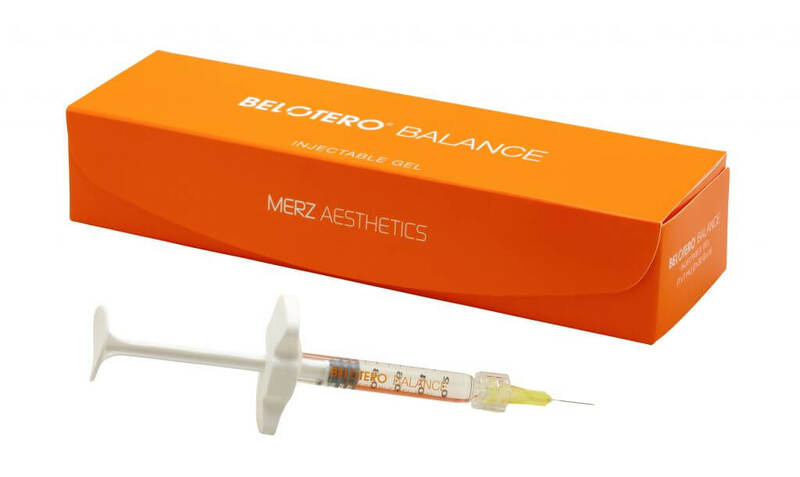 With BELOTERO BALANCE®, the injection process takes only about 15-20 minutes and results are immediate. Plus, there’s minimal recovery or downtime. So you can step into your doctor’s office for treatment and step right back into your life. How Long Does BELOTERO BALANCE®Last? BELOTERO BALANCE® is clinically proven to last up to 6 months in most patients. 1 It is an ideal option for treating moderate-to-severe etched-in lines and wrinkles around your mouth—such as vertical lip lines—that naturally occur from smiling, talking, and eating. When used in these active areas around your mouth, longevity of treatment results may vary. Is treatment with BELOTERO BALANCE® painful? Injections may cause some discomfort during and after the injection. Dr. Vendetti offers to numb the areas prior to injection, which provides adequate comfort during the injection. Hyaluronic acid is a naturally occurring substance found in all mammals that helps to hydrate and add volume to your skin. In addition to its use as an aesthetic treatment, hyaluronic acid has also been used for more than 20 years for injection into arthritic joints to aid movement. It has also been used for eye surgeries and wound repair. What are the possible side effects of BELOTERO BALANCE®? Most side effects are mild or moderate in nature, and their duration is short–lasting seven days or less. The most common side effects include, but are not limited to, temporary injection-site reactions such as redness, pain/tenderness, firmness, swelling, lumps/bumps, bruising, itching, and discoloration. As with all skin injection procedures, there is a risk of infection. Is BELOTERO BALANCE® Right for Me? BELOTERO BALANCE® injectable gel is clinically proven safe and effective when treating moderate-to-severe etched-in lines and wrinkles. 1-3 When offered by a trained medical professional like Dr. Vendetti, he can advise you if this would be the best injectable for your area of concern. Call or Contact Us to schedule a consultation to learn more. 1 BELOTERO BALANCE [Instructions for Use]. EM00494. Merz North America, Inc.; 2016.
comparative ultrasound study. Dermatol Surg. 2012;38(7 Pt 2):1162-1169.